Icelander Palli Kristjánsson is carrying on a tradition. Using natural materials that were available in the Viking Age, he brings them into today’s modern times in a new and highly artistic way. With his artistic approach to knife making he creates decorated knives that evoke the feral surroundings of his native land and the Viking Age of his forefathers. As the country’s only professional knife-maker, his work is in demand with collectors all over the world seeking out his highly individual creations. For the hilts or handles he uses reindeer antler, bone or hooves from sheep and cows, whale tooth and bone, and fossilised wood that is 12 million years old (brown coal or fossilised tree). He also uses an assortment of Icelandic stones. Soffía was born in Reykjavik but spent a lot of time travelling with her parents when she was young. She studied Fine Art in Rockford College (now University of Rockford, Illinois), living in the USA for several years. She has always been very interested in cooking, visiting different restaurants wherever she went to see how they cooked and, at the same time, developing a love for good knives. 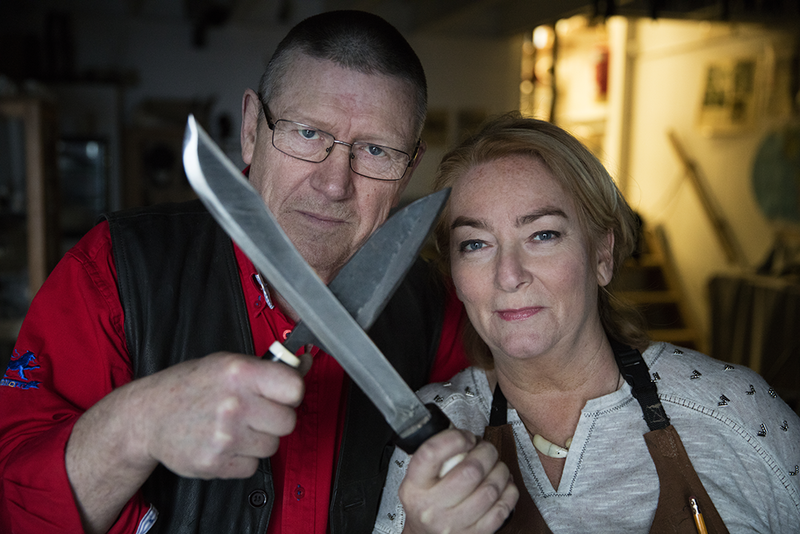 Soffia shares a workshop with Palli the Knifemaker, they generated a constant stream of new ideas in the artists’ village of Álafoss, just 15 minutes from the centre of Reykjavik. With over 20 years experience as a tour guide, she gains a lot of her inspiration from the Icelandic nature, as endless walks with Nora, her dog give her ideas for new creations. Soffía started making kitchen knives as a hobby but has now made this her full time career, specializing in high quality, Damascus steel kitchen knives, which will last a lifetime when properly cared for. These professional Japanese style knives with their handmade handles represent the ultimate kitchen tools with designs inspired by the wild, raw beauty of the Icelandic nature. With the vision of a chef and the mind of an artist. Using traditional Viking method, making every knife unique, Soffia works with materials available since the Viking Age. A horse’s hoof, a reindeer’s antler, whale tooth, fossilized wood or even different Icelandic stones, are but a few of the materials she uses for the handles. The blades however are not Icelandic. They are either skillfully handmade either made from fine Damascus steel or Japanese three layers steel. Soffia makes sure only to choose the best blades there are, which keeps the edges razor sharp.Truly a treasure to find. Kristjánsson wanders the highlands and lowlands of his beloved country collecting suitable materials for his labours of love. The sheaths he fashions for the knives are no less evocative. Using leather, wood, the skins of cow, seal and fish Kristjánsson creates a fitting holster, often, like the handles, intricately patterned with Viking symbols and carvings. The knife blades are not Icelandic, however. They are either hand-made copies of Iron Age or Viking Age designs from Denmark, Damascus steel, or factory-produced blades from other parts of Scandinavia. Knives can be custom made to order, the blade and handle materials being selected by the buyer. The knife will be delivered within 4-8 weeks. No two knives and sheaths are the same. 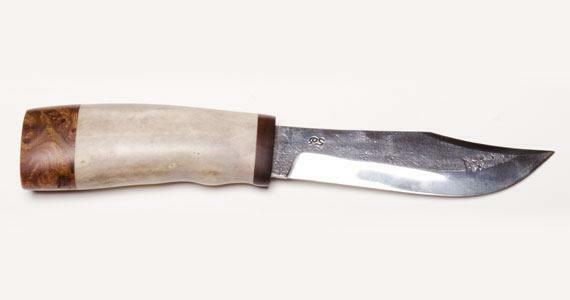 When you own a Kristjánsson knife, you can be sure that it’s unique.